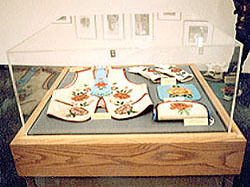 Historic Ute material on display at the Anasazi Heritage Center. From the photograph collection of the Bureau of Land Management, Anasazi Heritage Center, Dolores, Colorado. The Native American Graves Protection and Repatriation Act (NAGPRA) is another important piece of federal legislation that impacts archeological fieldwork and curation. Issued as final in 1990, at almost the same time as 36 CFR 79, NAGPRA deals with certain, limited kinds of archeological objects from both the field and the repository. Items covered under NAGPRA include Native American human remains, associated or unassociated funerary objects, sacred objects, and objects of cultural patrimony. It covers objects in federal or federally funded repositories. It also affects any public museum or repository that received federal funding before or since 1990. In the field, NAGPRA reinforces many aspects of ARPA. It also requires consultation (and proof of such) with Indian tribes if any remains or objects that might be subject to NAGPRA are likely to be excavated during fieldwork or are discovered inadvertently. NAGPRA has had several major impacts on archeological collections. First, it has set forth standards for repatriation. Second, it requires that every federal agency and federally funded museum or repository completes a summary of the NAGPRA-related objects in their care and an inventory of the Native American human remains and funerary objects. This process includes identifying ownership and cultural affiliation of these objects. Many agencies did not know what they owned or where it was located prior to this requirement. Many museums did not have adequate inventories of their holdings, both the collections they owned and those for which they were caretakers. NAGPRA has forced many agencies and museums to find out exactly what they own and for what collections they are responsible. NAGPRA also contains provisions for repatriation of these objects to lineal descendants or culturally affiliated Indian tribes or Native Hawaiians. Unlike 36 CFR 79, NAGPRA contains deadlines for compliance with its summary and inventory requirements and penalties for noncompliance. This has forced many agencies and museums to work quickly and diligently to comply with the law. NAGPRA also contains provisions to establish a grant process to help implement the law and its regulations. Again, this is something that 36 CFR 79 does not do. Between 1994-2000, the NAGPRA grants program has awarded 292 grants to Indian tribes, Alaska Native villages and corporations, Native Hawaiian organizations, and museums. The total amount awarded thus far is $15,310,035.